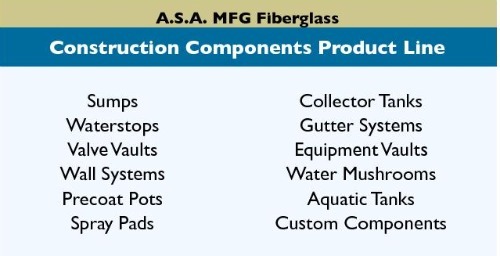 For over 20 years, we have been manufacturing modular & custom fiberglass construction components which are alternatives to typical “formed and poured " water features for the aquatics industry. Our A.S.A. 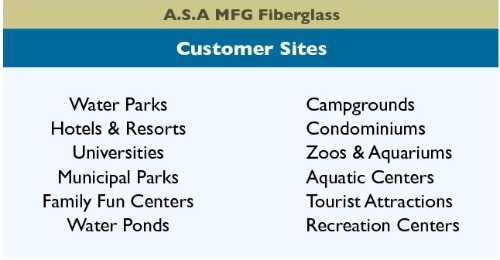 MFG line of heavy duty fiberglass construction components are proudly built in the U.S.A.
Our customers include aquatic attraction designers, builders and distributors who want quality fiberglass construction components. They choose A.S.A. MFG because our products are exceptionally strong, low maintenance, easy to install. You can find A.S.A. 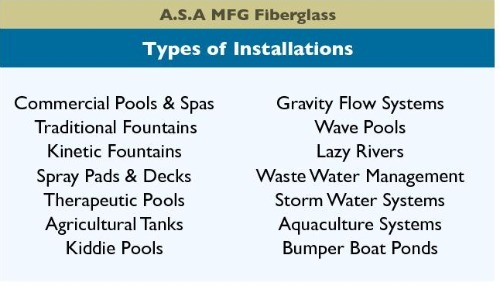 MFG fiberglass products installed across the country in a variety of aquatic applications.